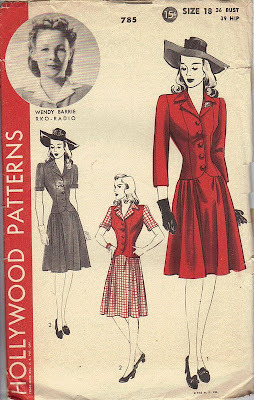 Ruffles & Whiskers: Simplicity 5645 (1964) Continued.. I've started putting together a muslin for my blouse this week, as the bust is actually a size bigger than I am I thought it best to play safe and do a test run. So far I've made a couple of amendments such as taking in the side seams (by 3cm each side!) and reshaping the armholes, but this was to be expected. I've used an old 1970's (I think?) bed sheet that my mum had stored in the loft for years and donated to me a while back along with some other material. It's pretty safe to say I would have never used this for anything worthwhile, so a muslin it shall be! There has been however, a couple of hiccups as far as the instructions are concerned. For one thing it mentions an interfacing pattern piece that does not exist in the actual pattern. Confused? Me too! The pattern has all pieces accounted for, but for some reason in the layout diagrams there is an extra piece called 'front interfacing' that isn't listed along with everything else, and there's no mention of what size/dimension it should be? 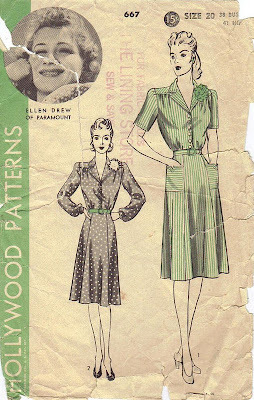 Either way, I don't see it as being too important as I have other patterns of a similar style that don't call for interfacing in the front (only collar/cuffs). I also had a misunderstanding with the collar/tie piece which ended up having one half cut on the right side, and the other half cut on the wrong side. If you look closely you might notice it! A lesson learned for next time! Next up for me are the facings & stitching the collar in place, then onto the sleeves. Some yummy blue leopard print cotton, which I'm very tempted to use for this pattern. Now to decide what to make with what? !